In 40 years, we have grown from three employees to 150 employees; increased the number of health programs we deliver from five to 55. The Shire of Mildura, through its representative Councillors H.W. Smith and RC Stirrat, attended a meeting at Mildura Base Hospital on 14 September, 1974, to hear submissions to the government’s Committee of Enquiry into Hospitals and Health Services. The Shire submitted that Merbein and District was poorly serviced in primary medical and nursing care. Sir Lance Townsend, Chairman of the Enquiry, suggested that Merbein and District should investigate the formation of a Community Health Centre to serve the community. The Shire convened a public meeting in Merbein on 31 October, 1974, and a steering committee was formed to develop a submission to the Commonwealth government’s Hospitals and Health Services Commission, for a grant to establish a Community Health Centre in Merbein. On 25 February, 1975, the steering committee announced that Merbein’s application had been successful. A nine member provisional Committee of Management was elected, and Councillor Smith was appointed as our inaugural President (Chairperson) of the Committee of Management (Board). The new Merbein Community Health Centre was registered on 8 April, 1975, and a former Presbyterian Manse was purchased as the site for the new Centre, at 36 Box Street, Merbein, for the sum of $32,370. The Centre commenced business on 15 August, 1975, when Dr. Shetty hired rooms for his GP clinic on a fee for service basis. Dr. Shetty was recruited from Broken Hill, by the Rotary Club of Merbein. Our first full-time salaried employee was Miss S.V. Pahl, who commenced as a receptionist/clerk on 8 September, 1975. Mr F.C. Skinner was appointed as our first Manager (CEO) on 18 November, 1975. 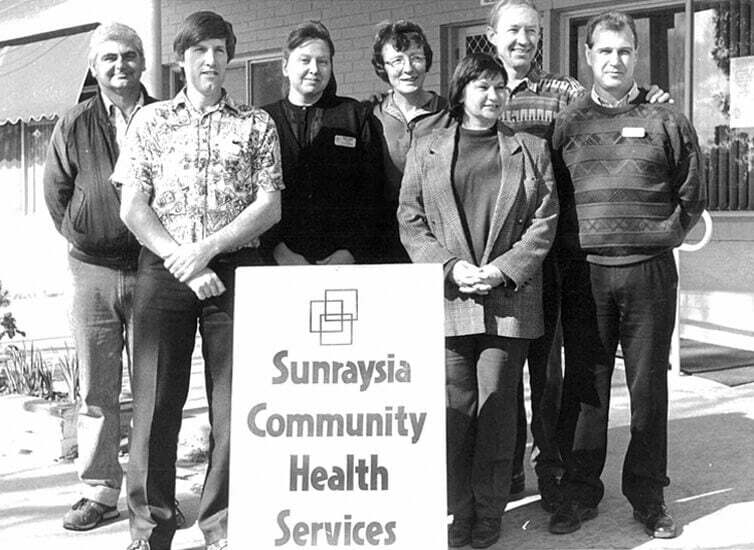 In 1989, we adopted the new name of Sunraysia Community Health Services, as we achieved rapid growth in the number of health services we were delivering across the region. In 1999, our Board of Directors lobbied the government of the day to commit land at Thirteenth Street, Mildura, for the development of community services. In 2010, Stage 1 of the Redevelopment Master Plan was completed, with some of our services being delivered from new facilities at 137 Thirteenth Street, Mildura. In 2013, the Commonwealth government entered into a joint agreement with us to complete Stage 2 of the Redevelopment Master Plan. The Commonwealth funded $15.26M and SCHS contributed $2M towards the total project cost. In 40 years, we have grown from three employees to 150 employees, increased the number of health programs we deliver from five to 55 and have grown our turnover from $36,000 to $13M. It has been an exciting journey!